The underlying fear of students is the loss of concentration options at schools throughout the state college system. With SUNY losing “about 1/3 of its support over the last three years” they fear that colleges will increasingly scale back on programming. “We fear that this latest cut to SUNY will mean more campuses being forced to phase out programs much in the way New Paltz has done with nursing, Geneseo with communication disorders, and Albany with several languages,” she said. However students are adamant that if increases do come that they are installed incrementally and used specifically to address Higher Ed spending. 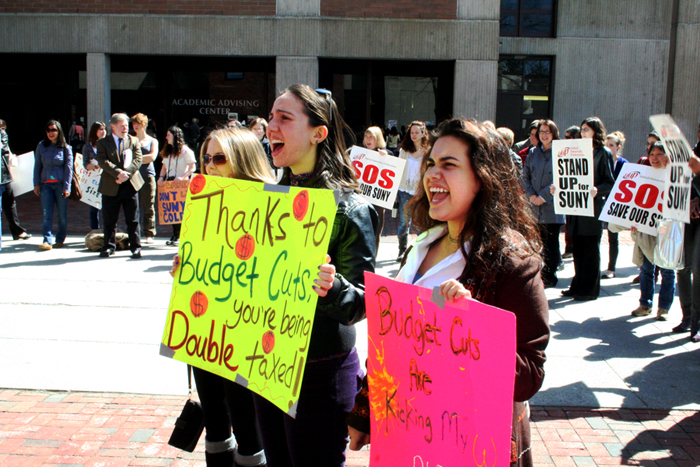 The previous jolt to tuition was a sharp $625 increase that went directly to pad general budget woes. The new plan could be shaped similarly to a proposal by former Governor Paterson and championed by Western New York legislators “to raise tuition by only 2.5 times the five-year average rate of the Higher Education Price Index, a widely used measure of colleges’ inflation costs” Though any plan that would give college presidents and trustees more say over tuition pricing will have significant opposition in the State Senate and Assembly as proved last year over the UB2020 plan.